The Jinx is a truly one-of-a-kind true crime viewing experience, and one that will never be repeated again (which almost forgives the DVD's complete absence of bonus features). There's a network that's available on most cable packages called Investigation Discovery. For true-crime aficionados the world over, it's the go-to destination for what is basically re-enactment television. There are shows like Snapped (about women who were driven to crime by extreme emotional duress), FBI: Criminal Pursuit (a series that recreates actual cases the FBI solved and how they got there), and Most Evil, a horrendously stupid show about "ranking" psychopaths and serial killers on an arbitrary number scale. In all of these programs, real-life interviews are meshed with straightforward and sometimes comically-cheap re-enactments. Still, by giving life to the tales told and not simply being an endless stream of talking heads, these programs have some vague sense of dramatic grounding, making for interesting, if not somewhat disposable television. While HBO's marketing department has gone to great lengths to make sure the word "groundbreaking" is associated on every advertisement and piece of packing material related to Andrew Jarecki's The Jinx: The Life and Deaths of Robert Durst, make no mistake: this is re-enactment TV, plain and simple. Interviews with key players take place and these people offer their remembrances of how they saw certain events, dramatic re-enactments take place giving visual grounding to their words, music swells, and so forth. On a purely structural basis, there's little here that separates The Jinx from a show like FBI: Criminal Pursuit, so make no mistake: Jarecki's passion project does little that is truly "groundbreaking" in terms of content or form. Yet what has turned The Jinx into nothing short of a cultural touchstone is not its many real-world connections or consequences, as fascinating and compelling as they are. Much like on Iron Chef, when a skilled culinary god is asked to "elevate" something like a taco into a Michelin-worthy meal, Jarecki has taken the tired and true format that is re-enactment television and given it the kind of consideration and presentation that we've come to expect from only the most decorated of filmmakers. The production design for every re-enactment is fluid and effective. The music, ranging from West Dylan Thordson and John Kusiak's haunting score to the selection of The Eels' "Fresh Blood" as its theme song, borders on perfect. The editing is measured and expertly-paced, and so on. 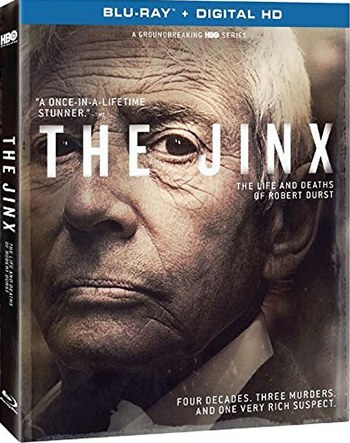 To say that The Jinx will go down as one of the most superlative achievements in television history is an outright lie: it already achieved that before even coming out on DVD. Jarecki's first film, 2003's haunting Capturing the Friedmans, was essentially the documentary equivalent of digging deep and hitting oil: by exploring the turmoil of a family whose patriarch, Arnold, and 18-year-old son, Jesse, were accused with both physically and sexually abusing young students in their home-taught computer classes, Jarecki discovered that pretty much the entire Friedman brood was addicted to filming themselves. Thus, he captured not only their day-to-day lives, but also the pain and suffering they endured as a trial is held despite the lack of any physical evidence connecting the Friedman males to the accusations against them. It's a haunting but even-handed film, both phrases that would've been great if they were applied to Jarecki's next project, the Ryan Gosling-starring All Good Things, a movie loosely based on the life of Robert Durst, the black sheep of a real estate family who has been widely considered a three-time murderer that has never been convicted. The film was neither a critical or commercial success, but its existence nonetheless found an interested audience member in the man himself, Robert Durst. It was Durst who struck up some conversations with Jarecki and, while describing the two as "friends" seems tenuous at best, Jarecki nonetheless was able to convince Durst to sit down for a long, expansive conversation about his life, his upbringing, and, of course, the disappearance of his first wife, one of his dear friends, and a man whom, by his own admission, Durst had chopped up into multiple pieces before tossing them out into the ocean. It was only the last case that Durst was actually charged for, but his well-financed legal team were able to secure a verdict of "Not Guilty", and even with no other charges brought against him prior to the broadcast of The Jinx, rumors nonetheless swirled around the eccentric man for the rest of his life. Early on in the show's expertly-managed six episodes, Jarecki asks Durst what he has to gain by sitting down with him and going through such a potentially risky project. Durst, in his sputters and blunt statements (which are softened by his age and husky tones), basically indicates that it's a chance for him to tell his life story from his perspective, having burned so brightly during the course of his 2003 trail in the media spotlight that he even had a Saturday Night Live sketch made about him. What he fails to realize is that prior to 2015, his profile had ebbed back into the celebrity ether, and doing this project, it turns out, granted him a level of infamy he never experienced before. Some would say Durst is afflicted with hubris, and those people would not be wrong. While Jarecki does interviews with every possible person he can think of, ranging from friends of Durst's first wife, to the attorneys who wanted to prosecute him, to a cab driver who drove him in California on a critical day, to an ex-juror who says that he thinks Robert is innocent, invariably, a subjective narrative is painted. Jarecki, with his own team researching and coming up with new findings every day, eventually foists himself into the documentary more and more, at one point crashing the fundraiser of Durst's more successful brother who had the keys to the family real estate empire handed over to him, despite Robert being the eldest. Yet much like the once-in-a-lifetime documentary jackpot, Jarecki scored with Capturing the Freidmans. The events that unspool during The Jinx's final two episodes are almost too stunning to be believed, elevating what would normally be just a very well-made HBO docuseries into something much more immediate and frightening. It's also a rare instance when the observer (Jarecki) has to put himself directly in the way of the subject (Durst). This eerily echoes fictional films like the 1992 documentarians-turned-participants thriller Man Bites Dog. Th resulting confrontation was unexpected, but one that remains so thrilling and so utterly iconic that no less than a year since the show's airing, Law & Order: Special Victims Unit's Season 17 opener ripped it off so shamelessly that it almost hurt. What the show's final episode unveiled has come under much scrutiny from the press and the public (not enough to prevent the program from winning a pair of well-deserved Emmys), postulating the question as to whether the filmmakers had any sense of obligation to reveal to the authorities what they discovered. Interviews following the finalé showed that what transpired came together almost as an accident, with one crew member just running through reams of recorded audio just to see if they missed anything and discovering what turns into The Jinx's final moments. Other stories pointed out that it is highly unlikely that the "spontaneous utterance" in question would be fully inadmissible in court (and clearly the filmmakers had knowledge of it, as they tease out this kind of behavior from Durst in prior episodes so as to establish a pattern). Even more to the point, prior to the finalé airing in March of 2015, Durst was arrested on charges of first-degree murder, by connecting him to previously-known evidence. As such, the buildup, the follow-up, and all the unanswered questions in-between would make for a fascinating addendum to an already-stellar series, but sorry kids: on both the DVD and Blu-Ray editions, there's not a single special feature to be found. Not a commentary, not a featurette, not even a trailer or TV bump. Those who wish to track down interviews that Jarecki and crew made following the show's airing are welcome to do so, but that's as close to a behind-the-scenes look as anyone is going to get. This is horrendously disappointing given how much meat The Jinx gives us to chew on. In late 2014, America was swept up by an unusual phenomenon in the form of Serial, a true-crime podcast hosted by Sarah Koenig that got millions of people wrapped up in the 1999 murder of a Baltimore girl whose killer may or may not have been wrongfully accused. The cultural momentum from that program carried nicely into The Jinx, and the two series together proved that smart, well-researched, and (most importantly) well-told crime stories could not only engage an entire nation, but entertain and inspire it, as well. One could argue that we are entering a new golden age of documentary journalism, but one would need more than two prominent examples in order to truly make that case. That being said, The Jinx is a truly one-of-a-kind viewing experience, one that will never be repeated again (or, for that matter, aired on Investigation Discovery).